Ask fellow campers about "All Star RV Resort" and nearby attractions. We stayed 2 different nights, parked by the office in pull in site 124. Older park with many full time trailers,campers, with huge trees, so watch your Sat, but strong cable TV & WiFi service. Super nice and friendly office staff. We stayed here to be close to galleria area. Pool area looked spotless and park is well maintained. We will stay here again when in Houston. With highway construction on Beltway 8, if you are going north on Beltway 8,watch for your east feeder street to I-59. Park is located east of PPL RV sales lots and behind Sterling McCall auto dealership, on the south side of I-59 - RV park has a sign on 1-59( southwest freeway). If you are going south on Beltway 8 , exit at 1-59 feeder road and go east. We camped at All Star RV Resort in a Motorhome. Sites are concrete ad, very narrow. We were here for only 1 nite & our site was right next to office, laundry & showers. Very convenient but no privacy. Entire complex is mostly concrete, narrow strips of grass. Landscaping was nice & well maintained. Laundry was superb. Dog walk area & dog wash facility! Nice rec room & heated pool. Located in a very congested area in back of several car dealerships. Would not stay here for an extended period bit one nite was fine. We camped at All Star RV Resort in a Fifth Wheel. We stayed here for 6 weeks while working the floods of Memorial Day 2015. Owners are consistently grooming and cleaning the sites. There are a lot of workers of various occupations, but it's very quiet, people are friendly but not in your business. The laundry is clean with several options of cycles so the $2.50 seems fair. We kept a clothesline between the trees in the back of our RV for line drying and that was readily acceptable. The pool was treated 3 X/day for bugs and the most I saw using it were 3, including me. An exercise room, a computer room, and pool table rounded out the community hall. They recently added TengoInternet, have cable, and Wi-Fi works great. Very close to the 59, the 8, the 610 easy to get to any place in Houston. Found it to be a utilitarian city but lots of wonderful places to eat. Close to La Porte, Galveston, and Beaumont. Would come again anytime. We camped at All Star RV Resort in a Fifth Wheel. Only a few sites in Houston proper, mainly historic/military, but Galveston has a real island feel to it. La Porte is a beautiful lake community too. Quilters should visit Tea Time quilt shop on the I-10. Oasis in the City! If you have to be in the city of Houston and are RVing, this is an excellent place to stay. Amenities include pool, spa, exercise room, clean laundry and restrooms, clean and well-groomed sites, many with trees. Great for RVing business travelers or temporary work assignment accommodations. We had intended to stay monthly to spend time with family, but it wasn't conducive to activity with our grandchildren. We stayed one week for about $40/night. We camped at All Star RV Resort in a Fifth Wheel. We pulled into the park, and it seemed to be very full with a lot of close neighbors. We got the next to the last site. Upon checking it out, the pedestal showed a reverse polarity. Going back to the office got the last site in the full sun. The lady said she would call maintenance to get it fixed. It wasn't fixed when we left two days later. When I asked for a refund, half price, the manager said he would not. Outside of this, the park wasn't too bad. We camped at All Star RV Resort in a Motorhome. We had a couple of problems... although we used the online reservation system and got a confirming call, when we arrived they had no reservation and we had to go into the "overflow" area. The Managers are the BIG plus at this RV park. They are very friendly and eager to help. The park is pet friendly and while they don't have an enclosed pet run, there is plenty of grassy areas to walk them. There is a nice gazebo just outside the office to sit and relax and BBQ if you like. BTW... if you want a great steak for dinner, ask the manager how to get to Sweetgrass. You will love it! Rate reflected Good Sam discount. We camped at All Star RV Resort in a Motorhome. We really enjoyed our stay at this resort. The managers are very friendly and helpful. They made us feel welcome after a long drive. The resort was clean. The dog wash was great for our puppies. We will definitely return to this resort! We camped at All Star RV Resort in a Fifth Wheel. Beautiful showers/restrooms. WiFi non-existent. Quiet park even though 98% filled. They don't really need transient business. Most of what previous reviewers have reported is correct. Very close quarters and big-rigs should not apply. Our van is 22' and fit space#15 perfectly. Office staff very pleasant and efficient. I would stay here again. We camped at All Star RV Resort in a Motorhome. Once you get settled in this park it has a lot going for it. Urban location, great services, clean bathroom, showers, gym, laundry etc. Nice concrete roads at least 30' wide. The problem with this park is that the sites are tiny. They are 35' long at the most so your RV fits but no toad or tow vehicle. Most sites have no room between RVs for parking so everyone parks on the 30' wide street (both sides) so its really hard to get your RV through the park and virtually impossible to get your RV into your site without getting people to move their vehicles. In order to cash in the park had RVs parked in the entrance ramp to the park and one on the road between sites further hampering access. Hard to sleep for the 3 nights we spent there. One neighbor arrived at 1 am and knocked on our door to get us to move our vehicle so he could maneuver. On another night a class A down our row went up in flames. The fire dept needed a bunch or vehicles moved to gain access. Not much left of the motorhome as the fire trucks could not get through all the parked vehicles. This place is a disaster waiting to happen IMO. They need to convert a few revenue spots to parking before I will return. We camped at All Star RV Resort in a Fifth Wheel. We have enjoyed staying here since March while working in the Houston area. Previous reviews are accurate about the park having many permanent and long-term campers. But with a few exceptions, the long-termers keep their sites neat. The grounds are very well maintained with lots of shaded sites, which was very important to us. Landscaping and gazebos are also very nice. Restrooms, showers, pool, spa & gym facilities are kept immaculately clean on a daily basis. Laundry facilities well maintained & reliable. Park is located right next to Highway 59 & the "outer" toll road (Highway 8), so there is lots of background highway noise. But the campground itself is very quiet. People are friendly and I feel safe walking the dog in the dark. It is an urban oasis, within the city limits, and definitely the nicest park on the south side of Houston (and we checked them all!). Whether for an overnight stay while passing through, or for longer working stays where you need to be close in to the city, we would definitely recommend this park. We camped at All Star RV Resort in a Travel Trailer. Clean restrooms. This is a RV campground (not really a resort). Management was rude. Older campground with lots of permanent residents with stuff piling up around some sites. For the high price, would not come back. We camped at All Star RV Resort in a Motorhome. The parks bills itself as a resort which it is not. You need more than a small pool and hot tub to be a resort. The grounds are clean as are the rest rooms but management is very rude. The managers are always outside the office smoking and do not seem to want to help with anything. Many residents (long term) in the park were openly complaining about the managers...seems they were new. Overall probably would not stay here again due to the management. Just got a bad feeling from the two of them. We camped at All Star RV Resort in a Motorhome. I really have a hard time rating this CG. We stayed for only a night. The sites are VERY close, but they offer free use of a gas grill, a hot tub, an in-season heated pool. When the battery in our towed was dead, the person in the office was quick to give us a jump. We camped at All Star RV Resort in a Motorhome. I was here on business. The original managers kept the park clean, pool clean and weight room clean. The lawn was manicured so not to have tree limbs hitting your camper/RV. The next managers, let the grass grow, rented to ANYBODY, and stopped trimming trees. It was like night and day. I went from feeling safe to feeling like I did not have enough locks on my door! We camped at All Star RV Resort in a Travel Trailer. We stayed here 6 months. Love the park: it's very clean. The workout room was a plus. Monthly rates plus electric were pretty pricey. Overall a great place to rest with plenty of shade. We camped at All Star RV Resort in a Fifth Wheel. 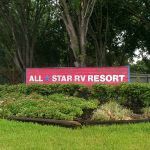 Are you affiliated with All Star RV Resort ?